This week we were thrilled to appear in not one but two prestigious publications. Wonderland featured in both North Wales Magazine and the National Day Nursery Association’s (NDNA) Nursery News. 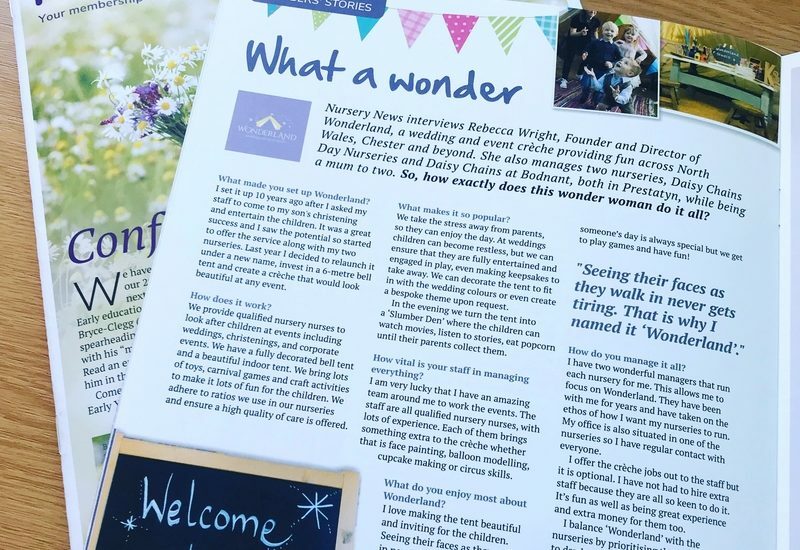 Over past months we have grown our profile using social media (@wondercreche) and via the press and online platforms, including the Daily Post, Nursery World and The Journal. As we prepare for a busy summer, including an upcoming wedding at beautiful Crewe Hall, momentum is starting to build. It’s been less than six months since we relaunched our wedding and event crèche service, and the response has been incredible. Thank you so much to everyone who has supported us, particularly the brilliant businesses and venues we are now collaborating with. It’s been a great start as we share our story and spread the word, but the hard work starts now!